Artists are not only wearing designer digs, but they are also singing about it and have their tours sponsored by clothing companies. Label dropping is a predominantly rap and hip-hop pastime. It’s only natural that the music industry and fashion trends intersect at the alley ways of street fashion and the prêt-a porter runway. We can see it in music videos, film and the high profile coverage given to music in magazines and on TV talk shows. Today, you cannot NOT recognize what the artists are wearing. They are wearing and talking about the fashions coming out of Milan. 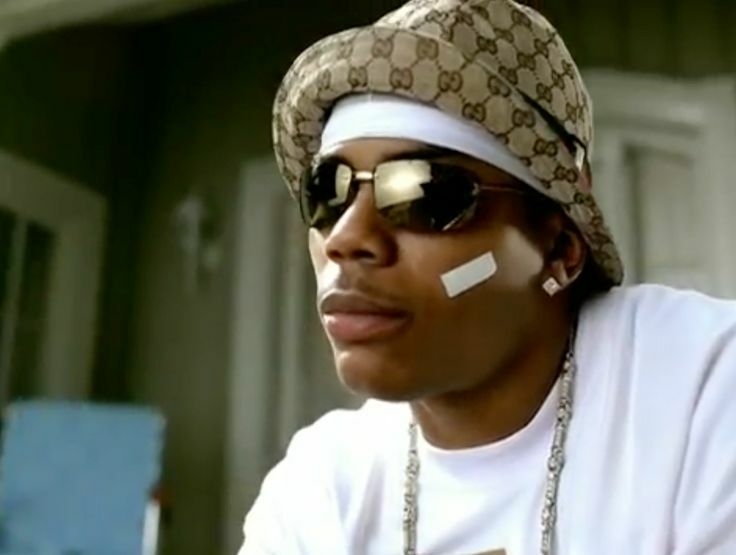 Nelly in his video” Nellyville – Dilemma” with Gucci hat. In the same video, Kelly Rowlands wears Missoni. After bell bottom’s started to go out of out of style and a tough break in up-state New York, Tommy Hilfiger launched his own label (New York, 1984), many were sceptical that he could compete with the other top American design houses. He faced tough competition with the established Calvin Klein, Perry Ellis and Ralph Lauren. In the mid ’80’s Tommy Hilfiger’s success boomed once he hooked up the rap sensation the Grand Puba bringing him into the hip-hop sub-culture and subsequently, a strongly growing market. The “old school” hip-hoppers dressed in baggy pants, oversized football and basketball jerseys, and expensive sneakers. Run DMC were not only pioneers in the hip-hop music scene but were inadvertent fashion trend setters. Their song “My Adidas” had every kid hip-hopper or not, wearing Adidas. Once Tommy Hilfiger started getting his colourful designer sports gear styled into videos and on some of the top rappers, he was almost instantly an integral part of the hip-hopper and the hip-hopper wanna-be look. Today, artists like Jennifer Lopez, Sheryl Crow, and the Rolling Stones are dressing in T.H. and even Ali G. the British comedian talk show host is always geared up in the red, white and blue. Designer and luxury items are synonymous with status, power and success. When artists are asked if they were paid for the name-dropping, the response is usually “No, it just rhymed the right way” or “It’s a part of pop culture and everyone can identify with it”. When companies are asked if they paid for it, surprisingly enough, the answer is “No, but we sure like the extra publicity”. In the end, it benefits both the artist and the designer. Lauryn Hill never sang about her jeans or evening dresses, but her 2002 USA tour was sponsored by both Levis and Giorgio Armani. Although names like Gucci, Prada and Versace are normally associated with high class and luxury, Lil’ Kim, Jay-Z and Nelly know how to make them all seem so decant. Next time you watch a music channel or read a music magazine, check out what they’re wearing, and listen to who they are singing about, it is clear that the stars today are keen on the Italian fashion designs coming out of Milan.